Listening to a Sunday sermon delivered from a nearby evangelical church, I am reminded how the endless cycle of conflict is reflected in the violent imagery of zealous preachers. But in Monrovia, Sunday offers a different form of deliverance. 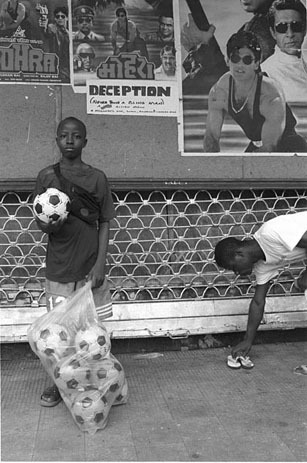 Matches are played across the town, and the city falls into a self imposed curfew as people gather to watch. It is in these arenas that real rehabilitation is taking place, as people celebrate the simple rhythms of life: love, laughter, and hope. Words © Tim Hetherington 1999.